Albert Artwell holding “Black Star Liner”. Image courtesy of Jessica Ogden. 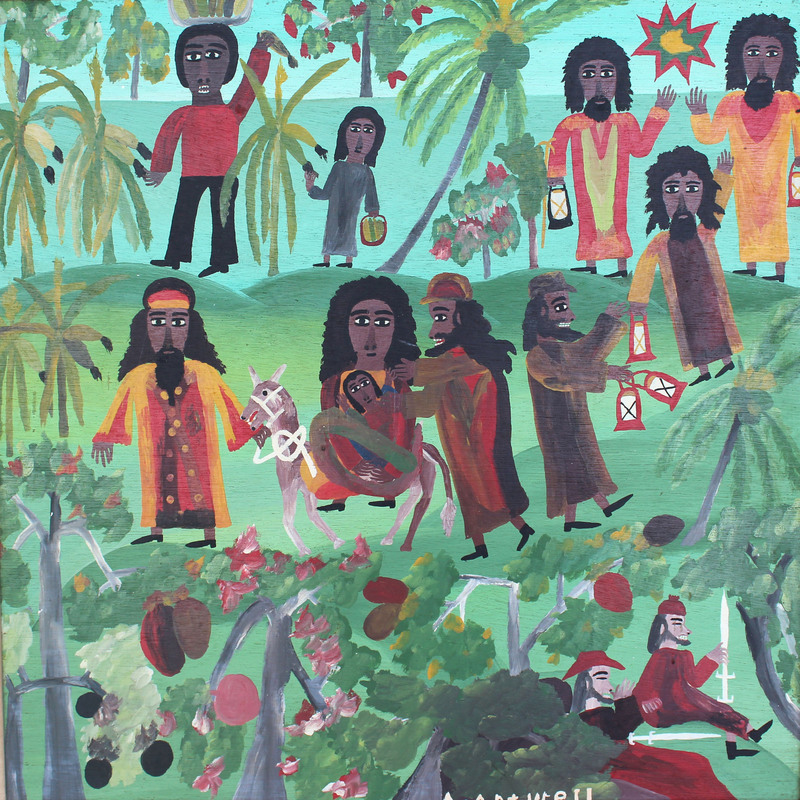 The National Gallery of Jamaica has received the sad news of the passing renowned intuitive painter Albert Artwell. Albert Artwell was born in 1942 to farming parents in Catadupa St. James. He attended school in the same district and eventually became a farmer himself. At the age of 26 he grew locks after having visions of the Biblical prophets Abraham and Moses and saw himself as a shepherd of the Rastafari faith. Deeply religious, he differentiated himself from other Rastafari claiming to be a ‘Hebrew,’ “because he recognized Abraham as the father of the Israelites.” The genesis of his artistic production can be traced back to the highly decorated hardboard panels on which he used to write verses from the Bible that held personal significance for him. Religious visions played a critical role in his artistic development, as they were noted as the inspiration for his decision in 1975 to begin illustrating scenes from the Bible which proved to be recurrent themes in his painting for the rest of his career. His paintings utilized the archaic compositional device of vertical stacking, which is found in Egyptian art and other African artistic traditions including Ethiopian Illuminated Manuscripts. The sometimes seemingly arbitrary scale of his figures, are also related to a hieratic compositional mode found in medieval and ancient Egyptian hieroglyphics in which the relative importance of the figures in the work, relate to the artist’s concept of their importance in the narrative presented. His work was exhibited locally in the Fifteen Intuitives and the Intuitive Eye at the National Gallery of Jamaica and internationally in the critically acclaimed Jamaican Art 1922-82 exhibition staged at several North American venues by the Smithsonian Institution Travelling Exhibition Service (SITES); The Commonwealth Institutes Jamaican Intuitives staged in London, Sheffield and Edinburgh in 1986 and Redemption Songs: The Intuitive Artists of Jamaica which toured the United States from 1999-2002 and most recently the Jamaica Jamaica! Exhibition staged last year at the Philharmonie de Paris which travelled to Brazil and is currently on show at the SESC 24 de Maio in São Paulo. Over the years his work was very popular with collectors of Jamaican Intuitive art and he developed a close working relationship with several of the galleries that represented him in particular the Harmony Hall Gallery in Ocho Rios and the Gallery of West Indian Art in Montego Bay. In 2003 Albert Artwell received a bronze Musgrave Award from the Institute of Jamaica for Outstanding Merit in the Field of Art. The Board of Directors and the staff of the National Gallery of Jamaica wish to extend their deepest condolences to the family and friends of Albert Artwell. 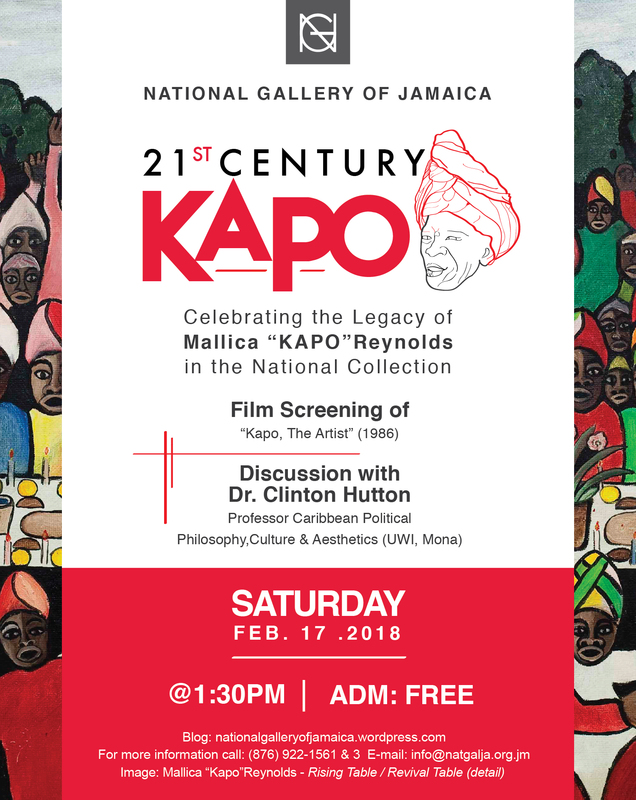 As part of our programming for Black History Month, the National Gallery of Jamaica (NGJ) will be hosting a special event on Saturday February 17, 2018, at 1:30 pm entitled 21ST Century Kapo. Mallica “Kapo” Reynolds is considered to be Jamaica’s foremost Intuitive artists; and the newly reinstalled gallery features a selection of sculptures and paintings from the Larry Wirth Collection, the John Pringle Collection and the Aaron and the Marjorie Matalon Collection. The works in these galleries showcase the broad subject matter and iconography that Kapo explored and highlight the cultural significance of this artist. 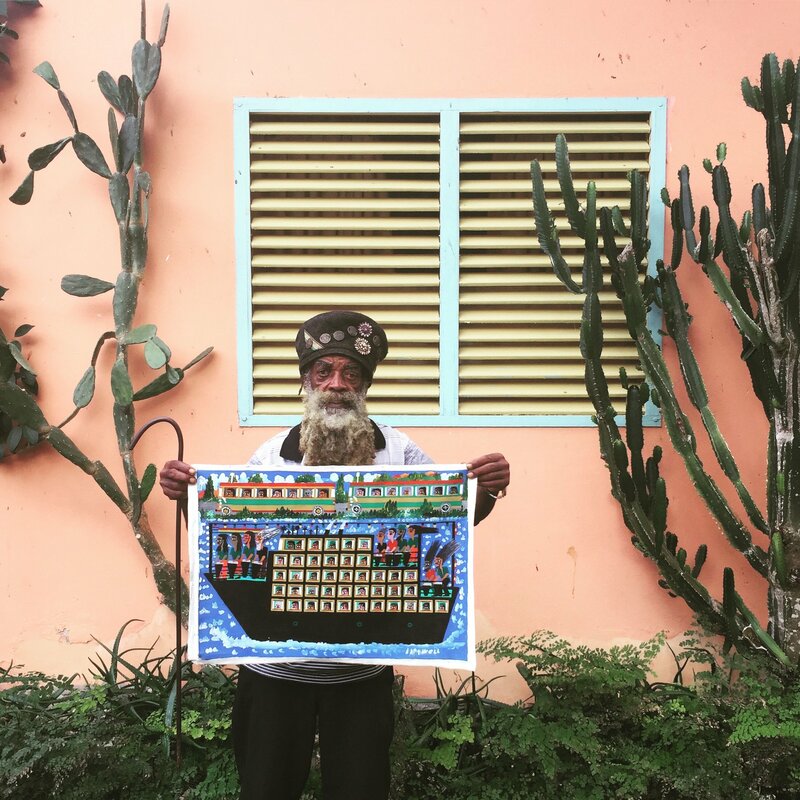 The Kapo Gallery – which is one of only two NGJ galleries that are dedicated to single artists – was reopened on January 28 after being closed for almost a year; 21st Century Kapo will give the public an opportunity to learn more about this artist and engage in a discussion of his legacy and relevance to Jamaicans today. 21ST Century Kapo will feature a special screening of the archival film, Kapo the Artist, which first aired on BBC TWO in 1986. In it Kapo speaks about his life and work as an artist and Revivalist leader, it features commentary by Dr. David Boxer, Professor Rex Nettleford and Ambassador Dudley Thompson among others. The screening will be followed by a short, candid discussion between Dr. Clinton Hutton, Professor of Caribbean Political Philosophy, Culture and Aesthetics (University of the West Indies, Mona) and NGJ Senior Curator, O’Neil Lawrence. Attendance to 21ST Century Kapo is free of cost and is open to the public. Visitors are being encouraged to view the newly reinstalled galleries prior to the beginning of the discussion. Another post on the Annabella and Peter Proudlock Collection exhibition, which is on view at the NGJ until November 4. The thematic structure of this exhibition is designed to encourage the viewer to approach the works on display for their potential to tell particular aspects of the story of Ogden-Proudlock family, and it is important to note that they lived with all of these works at their Te Moana home, in configurations which were often quite different from what is presented in these galleries. This gallery attempts a more intimate look at what it meant to “live” with this extensive collection and the installation in this section reflects less of the conventional gallery aesthetic and more of the reality of living with a large collection. There were interesting demarcations within the Proudlock home, with the more public areas of the living room displaying their beloved Jamaican Intuitives, most of which are to be found in Gallery Four, but which are represented here by the works of Zaccheus Powell and William “Woody” Joseph. The living area also featured works by friends such as Lisa Remeny, whose surreal work depicted daily life at Te Moana itself, Graham Davis, and Jonathan Routh (whose works on the Harmony Hall theme can be seen in Gallery Two). The exuberance found in the colours and subject matter of the “tourist” art that was mounted in their large kitchen reflected their travels to locales such as Haiti and Costa Rica, while the more intimate areas of the bedrooms held works that were more restful or of personal significance, such as Angela Landels’ portraits of Annabella, Sebastian and Jessica in Gallery One, or works by close friends and frequent Harmony Hall exhibitors such as Colin Garland, Albert Huie and Graham Davis. Another post on the Annabella and Peter Proudlock Collection exhibition, which continues until November 4. Harmony Hall was originally built in 1886 and was renovated and restored in 1980-81, opening on November 14, 1981 as a gallery and craft centre, with a restaurant on the ground floor. Harmony Hall attempted to bridge the gap between what has at times been disparagingly referred to as “tourist art” and the local and regional art worlds. It quickly became the premier North Coast gallery, known for its promotion of a wide variety of mainstream artists and craftsmen, but primarily the Jamaican Intuitives, and featured works by artists such as George Rodney, Colin Garland, Albert Huie, Zaccheus Powell, Everald Brown and Mallica “Kapo” Reynolds. That Annabella Proudlock, who was Harmony Hall’s Managing Director, and her husband Peter Proudlock, who was also a partner in Harmony Hall, collected most of the artists they exhibited at Harmony Hall reflects the close and supportive working relationships they maintained with these artists and their collection thus also tells the story of Harmony Hall. The handsome Victorian-style Harmony Hall building quickly became a landmark, and was recognized as a national monument by the Jamaica National Heritage Trust in 2003. It appears as a subject in the work of several of the artists in this exhibition and these tributes also stand as a testament to the lasting and productive relationships that were built by its proprietors. Welcome to Harmony Hall (2006) by Michael Parchment depicts an active, cheerful space filled with patrons; Irise’s Blue Hole at Harmony Hall (1987) reflects on the beauty of the building, and several of Jonathan Routh’s raucously politically incorrect works place Harmony Hall in various fictitious historical contexts and pay tribute to the rising profile of the gallery. The Annabella and Peter Proudlock Collection exhibition opens this Sunday, July 30, and will continue until November 4. This is the first of a series of posts based on the text panels in the exhibition. The Annabella and Peter Proudlock Collection exhibition features a generous, near-complete selection from the joint collection of Annabella and Peter Proudlock, which forms the largest part of this exhibition, along with works that were owned by Annabella and her family before her marriage to Peter, and two works that were previously part of these collections but are now owned by others, Annabella’s son Sebastian Ogden and her friend and associate Maxine Walters. The exhibition provides a vivid picture of the lives, artistic interests, professional and personal relationships, and cultural entrepreneurship of several personalities who have played a vital role in the development of Jamaican art, individually and through Harmony Hall, which has been the premier art gallery and craft centre on the Jamaican North Coast since it opened in 1981. Much of the work in this exhibition was acquired from Harmony Hall exhibitions and a number of works actually depict the Harmony Hall building. The central personality in the stories told by this exhibition is Annabella Ogden Proudlock, who was the Managing Director of Harmony Hall until she passed away in 2015. Annabella (née McCartney), a successful London – based fashion model, fell in love with Jamaica when she visited for a swimsuit shoot for Silhouette in 1966 and moved to the island that same year. She worked with Operation Friendship, an inner-city charity in Kingston, from 1966 to 1978, and was responsible for that organization’s pioneering and very successful local Christmas card programme, which featured the work of children in the programme and various local artists. After the death of her first husband, English-born cinematographer, artist, musician and writer David Ogden in 1978, she moved to Ocho Rios in 1979 and started the production of the Annabella Boxes, finely crafted cedar boxes with reproductions of Jamaican art that quickly became a classic in the local craft industry. The following year, she was part of the team that acquired and restored the Harmony Hall building. Annabella oversaw most of the artistic direction at Harmony Hall for nearly twenty-five years and is best known for her close, supportive work with the artists and craft producers who exhibited and sold their work at Harmony Hall, especially the Intuitives. She served on the National Gallery of Jamaica Board for many years, until 2012, and in later life became an artist in her own right, who produced meditative collages from shells and other found sea objects. This exhibition is also our tribute to Annabella. Annabella and David had two children, Sebastian, who is a graphic designer and advertising executive, and Jessica, who is a fashion designer and textile artist. Peter Proudlock, a chartered accountant, moved to Jamaica from England in 1981 and became a partner in Harmony Hall. He and Annabella got married in 1985 and he continued managing the gallery after she passed away in 2015, until his own death in 2016. Harmony Hall, which is located near Ocho Rios in Tower Isle, St Mary, was constructed in 1886, as part of a pimento plantation and served as a Methodist manse. It had been modernized and served as a family home in the 20th century until it came on the market in 1979-80. The house was lovingly restored by a team consisting of Annabella, Graham Davis, the architect Ben Eales and the artist and designer Dawn Scott, who designed the fretwork decorations that were based on traditional Jamaican patterns. The building was in 2003 recognized as a National Monument by the Jamaica National Heritage Trust.